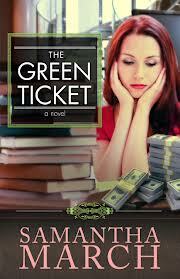 I was both excited and nervous to read The Green Ticket by Samantha March , when I don’t have my nose in a book I am running my beauty salon and so my two main passions in life were coming together I was hoping that I was going to love this book. While struggling to keep her wits and stay happy with her new grown-up job, Alex is juggling college courses, a new love interest, and keeping up with her close group of girlfriends. When her roommate and best friend Lila gets offered an opportunity to move to Los Angeles and sign with an agent, Alex realizes her life truly is changing, and everyone around her – including herself –– is growing up. Knowing she is faced with some hard decisions ahead, Alex struggles with keeping her job at Blissful. But does she really want to throw away what she dreamed of as a career – or will the secret-keeping for Kevin become too much to handle? Alex is a genuinely warm character who takes on a huge responsibility for a twenty year old by running a spa salon. Throughout the book she has some difficult situations to deal with and I think she seemed very mature the way she dealt with the situations I had to keep reminding myself she was only twenty! The salon relationships between the colleagues felt very realistic and it felt as though the author had spent some time behind the scenes at a spa to see the way things work, this comes across well in the book. The description of the spa and treatments were very interesting and informative and really set the perfect scene. There are some wonderful friendships in this book and when the girls get together it brought a fun feel to the book. I did find parts of the book a little predictable but I loved reading Alex’s journey in her new career. I had warning alarms going of in my head from our first meeting with Kevin I was just waiting for things to kick off. I was expecting there to be some stereotypical references in this book as there always are when it comes to our trade but the author showed the professional side of Beauty rather than the fake looking therapist painting pink polish. So in the end the book was a joy to read and I found myself relaxing into the storyline. I really enjoyed this book and would definitely recommend this book I look forward to reading more books by this author.